Matthew 2:1-10, Do You Hear What I Hear? It's not Epiphany yet; it's still Christmas. Advent is the four Sundays and three to four weeks before Christmas, Christmas is December 25 to January 5, and Epiphany is January 6. Nevertheless, we are moving on in our study to some songs for Epiphany, which celebrates the visit of the scholars from the East to the infant Jesus and, by extension, the revelation of the Messiah to the whole world. Some of the hymns we will look at this week are traditionally sung as Christmas carols; however, they are ones that emphasize Christ for the world. I confess to mixed feelings about today's carol. You hardly ever get a new Christmas carol, but not only was "Do you hear what I hear?" brand new in 1962, but it was a smash hit then and has since been recorded by hundreds of artists. I love this carol – it takes me back to my Grandma's kitchen every time I hear it. And it's a great song for Epiphany: the night wind tells the little lamb, who tells the shepherd boy, who tells the mighty king, who tells the people everywhere. Wonderful, evangelistic stuff about Christ for the world. However, I'm forced to tell you that the shepherds did not say anything to the mighty King Herod; the scholars talked to Herod. And Herod, far from telling people everywhere the good news, sent soldiers to Bethlehem to kill all baby boys under the age of two. He was a mighty bad king. Everybody's favorite Epiphany hymn is "We Three Kings." Never mind that "magi" means "scholars," not kings. (By the way, thanks to non-reader Madison L. for the great translation "scholars," which I adopted instantly.) Never mind that the number of scholars is unspecified. It's still our favorite. 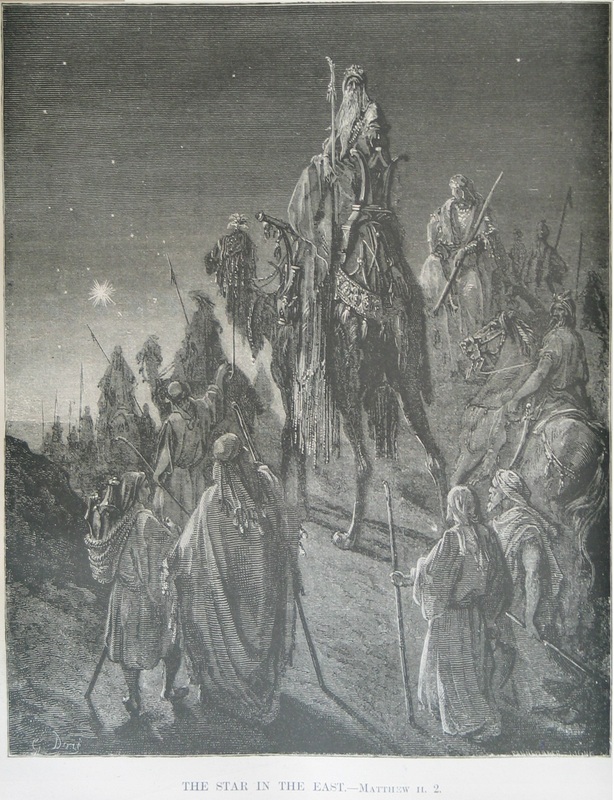 The scholars did indeed bring three gifts – gold, frankincense, and myrrh. These gifts are traditionally interpreted to acknowledge Jesus as king, God, and sacrifice, respectively, as in the hymn. John Wesley says, "Probably these were the best things their country afforded; and the presents ordinarily made to great persons. This was a most seasonable, providential assistance for a long and expensive journey into Egypt." Notice that the family was now living in a house, that Herod slaughtered two-year-olds and younger, and that the family was impoverished at the time of Jesus' dedication in the Temple. All three factors show that the scholars did not arrive until quite some time after Jesus' birth. Fellow-reader Joan S. notes, "I'd never thought about [Jesus' family] being in a house when the scholars arrived....it's interesting that you read this story all of your life and overlook some of the smallest details." I had never noticed this detail myself until I read a commentary that pointed it out. We are so bombarded with pictures of three kings in the stable that we can't see the house in the scripture! Today is the last day of our third year together, and I hope that you, too, have made discoveries here and there about details of the scriptures. The idea that God's people should spread God's message throughout the world did not originate with the Church. When God first made a covenant with Abraham, he said, "I will bless you, so that you will be a blessing. Through you, all the nations of the world will be blessed" (Genesis 12). By the time of the prophets, the idea was fully developed that the nations (i.e., all non-Jews) were living in darkness, and that the children of Israel would ultimately bring them into the light. And who was to be the agency of this light? The Messiah, the LORD'S Christ. Did you ever have a mountain-top experience? The scriptures tend to associate mountaintops with great faith experiences. God tested Abraham by asking him to go to a mountain to sacrifice Isaac. Moses got the law on a mountain. Satan took Jesus to a mountaintop to tempt him. Small wonder that the last time Jesus met with his disciples, it was on a mountain. So the eleven disciples went into Galilee to the mountain where Jesus directed them, and seeing him, they worshipped him, although some doubted. Jesus came up and said to them, “All authority in heaven and upon the earth has been given to me. Go, now; make disciples of all nations, baptizing them in the name of the Father, and of the Son, and of the Holy Spirit, teaching them to obey everything that I have commanded you. And, you see, I will be with you always, even until the end of age.”Happy New Year! The Star in the East, by Gustave Dore, showing the magi's trip to Bethlehem is from the Gartin family Bible, now in the private collection of Regina L. Hunter.